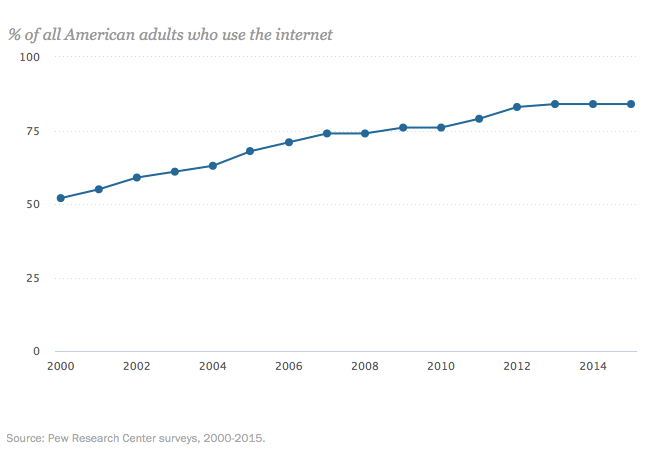 Internet use in the U.S. is nearing saturation, according to a new analysis from the Pew Research Center aggregating survey results of American Internet habits over the last 15 years. Age, class, race/ethnicity and community differences have always shaped Internet practices. 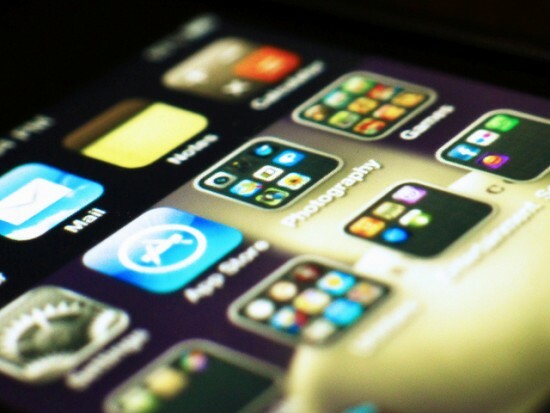 Changes in technology — especially the increase in smartphone use — has influenced the trend toward saturation, as has the fact that older Americans are jumping on board, said Maeve Duggan, one of the authors of the report. Fifty-eight percent of senior citizens in 2015 use the Internet, compared with 14 percent from 2000. In comparison, 96 percent of young adults aged 18 to 29 use the Internet now — higher than the percentage from that same age group who reported Internet use in 2000 (70 percent), but not as large the percentage of senior citizens using the Internet within the same time frame. That young adults have been earlier adopters of the Internet is one reason for the larger increase in seniors using the Internet, as the figures show. But how people react to technology in general also follows a path that Internet adoption stories mirror, which this data — as an aggregation of several individual surveys — shows clearly. Duggan said that Internet use may now be due to persuasion from peoples’ family networks and others who might want want them to be online for various reasons. A previous Pew survey conducted in 2013 found that 15 percent of American adults did not use the Internet at all. Respondents cited lack of relevancy, the difficulties of using the Internet, the financial costs of owning a computer or paying for an Internet connection, and the lack of availability as reasons for not using the Internet. Yet the improvements in technology and increase in smartphone use have undoubtedly helped other groups who might have not have had access to the Internet before get online. Photo by Flickr user Daniel Go and reused here with Creative Commons license. Social class, including household income and education, are strong indicators of Internet consumption. Higher income earners are more likely to be online than low income earners; 97 percent of adults living in a household that earns at least $75,000 a year use the Internet, for example, compared with 74 percent of adults living in a household that earns less than $30,000 a year. And college-educated adults are more likely to use the Internet than those without a high school diploma. But the relatively recent rise of smartphone ownership has now afforded lower-income people, who might not own a computer or have a broadband connection, a way to access the Internet at sometimes cheaper prices. A Pew study on smartphone use in the U.S. released earlier this year found that nearly two-thirds of Americans now own a smartphone. And 19 percent of the American population relies on this mobile device to a certain extent to access the Internet. It may be that they don’t have a broadband connection, or that they don’t have many other options to access the Internet other than a smartphone. “Anyone who says yes to either of those two questions is an Internet user,” Duggan said. The full results of the Pew analysis on Americans’ Internet access from 2000 to 2015 is available online. This piece originally published on July 2, 2015, on MediaShift.